4 Bedroom Detached House For Sale in Daventry, Northamptonshir for Guide Price £985,000. A rare opportunity to commission the build of an individual four bedroom detached stone built family home on an exclusive small development, located in an enviable semi-rural setting with outstanding countryside views. Whitmill Hill Farm is a small development of just five high specification luxury family homes all built to order. Using only traditional materials, the new homes have been designed to blend completely into their rural setting. 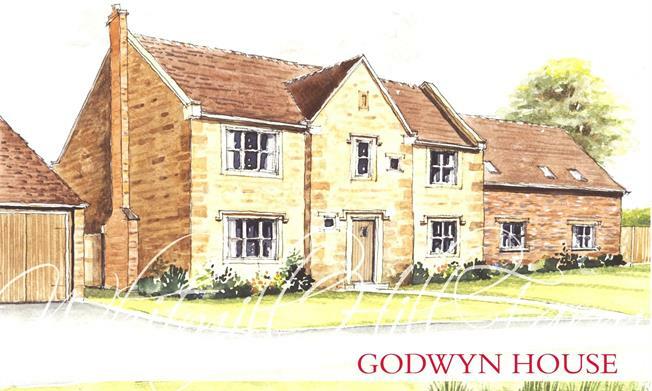 The property to be built will be known as Godwyn House and will be constructed with a mixture of Cotswold ironstone and brick beneath a slate roof to a high specification. Built with the utmost care and precision, with the option to save money on stamp duty and the chance to design your own home. Currently designed to accommodate a living room, dining/media room, study, cloakroom, kitchen with a larder, utility room, boot room and an additional family room on the ground floor. The property will have a large double garage with additional independent accommodation over the garage which can be used as an office/playroom/games room or bedroom if required. Isis Builders are offering the opportunity to alter the internal design to suit individual requirements and lifestyle. Staverton Village is in the south west corner of rural Northamptonshire, a few miles from the Oxfordshire and Warwickshire borders. Staverton has a public house The Countryman, which boasts local ales and a restaurant. There is also a garage in the village as well as Staverton Park which includes: hotel, indoor leisure complex and an 18 hole golf course and driving range. Staverton’s Church of England Primary School has approximately 100 boys and girls from 4-11 years of age. There are a number of independent and preparatory schools all within a 30 minute drive of Whitmill Hill Farm. Set in the ‘Heart of England’ Staverton is just 12 miles west of Northampton and east of Leamington Spa, and is also close to Banbury, Milton Keynes and Warwick. The M40, M1, M6 and A5 are all easily accessible giving good access to Birmingham, Northampton, Oxford, Warwick, Coventry, Rugby and Milton Keynes.